‘Reach Martin Luther to Washington’ is an elementary Martin Luther King Jr. worksheet that will introduce kindergarten kids to the rich history of the great personality. 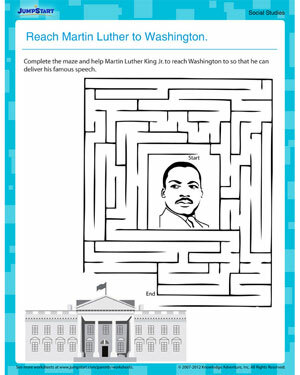 The free Martin Luther King Jr. maze is specially created to commemorate Martin Luther King Jr. Day and make kids have fun while learning about him at the same time. Browse more printable worksheets for kids online.